Argizagi Ederra (1976) — soprano with harpsichord Ann Carr-Boyd Danielle Grant, Diana Weston 2 mins, 59 sec. Australian Dawn and Bush Dance (2016) for 2 violins and piano — Australian Dawn Ann Carr-Boyd Cedar-Rose Newman, Lina Lee, John Martin 4 mins, 39 sec. Australian Dawn and Bush Dance (2016) for 2 violins and piano — Bush Dance Ann Carr-Boyd Cedar-Rose Newman, Lina Lee, John Martin 4 mins, 42 sec. Recorded/performed at: Tiger Recording Studios, Neutral Bay, NSW, on 17 Jun 05. Ann Carr-Boyd Susan Blake, John Martin 17 mins, 23 sec. Recorded/performed at: Albert Sudios, Neutral Bay, Sydney, on Oct 09. Ann Carr-Boyd John Martin 4 mins, 36 sec. Recorded/performed at: Tiger Recording Studios, Sydney, on May 04. Ann Carr-Boyd John Martin 4 mins, 4 sec. Recorded/performed at: 'Cool Valley' concert, Penrith NSW, on 26 Jul 08. Ann Carr-Boyd David Papp, Manu Berkeljon, Victoria Jacono-Gilmovich, Yilin Zhu, Patrick Suthers 4 mins, 11 sec. Fandango (1982) for mandolin ensemble Ann Carr-Boyd Sydney Mandolins, Adrian Hooper 4 mins, 43 sec. Recorded/performed at: 'Cool Valley' concert, Penrith, NSW Ann Carr-Boyd Victoria Jacono-Gilmovich, Manu Berkeljon, Yilin Zhu 2 mins, 53 sec. Recorded/performed at: Studios 301, Sydney, on 2014. Ann Carr-Boyd Diana Weston, Thoroughbass 7 mins, 38 sec. Recorded/performed at: University of Wollongong, on Feb 08. Ann Carr-Boyd John Martin 3 mins, 9 sec. Images of Australia (1985) for full orchestra Ann Carr-Boyd Adelaide Symphony Orchestra, Arnold Butcher 55 sec. Music for an imaginary Italian film (1986) for mandolin ensemble Ann Carr-Boyd Sydney Mandolins, Adrian Hooper 8 mins, 38 sec. Recorded/performed at: 'Cool Valley' concert, Penrith, NSW, on 26 Jul 08. Ann Carr-Boyd Manu Berkeljon, Victoria Jacono-Gilmovich, Yilin Zhu, Patrick Suthers 3 mins, 1 sec. Recorded/performed at: Studios 301, Sydney, on 2014. Ann Carr-Boyd Diana Weston, Tara Hashambuoy 5 mins, 22 sec. Recorded/performed at: University of Wollongong, 2007-2008 Ann Carr-Boyd John Martin 3 mins, 32 sec. Recorded/performed at: 2MBS-FM Studios, Sydney, on 1998. Ann Carr-Boyd Paul Champion, Tony Baldwin 5 mins, 53 sec. 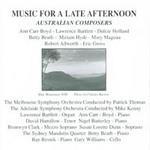 Ann Carr-Boyd Sally Mays, Tasmanian Symphony Orchestra, Patrick Thomas 21 mins, 38 sec. Recorded/performed at: 'Cool Valley' concert, Penrith, NSW, on 26 Jul 08. Ann Carr-Boyd Manu Berkeljon 2 mins, 5 sec. Prelude for violin and piano (1993) for violin with piano Ann Carr-Boyd Cedar-Rose Newman, John Martin 3 mins, 43 sec. Recorded/performed at: University of Wollongong, on Feb 08. Ann Carr-Boyd John Martin 2 mins, 34 sec. Ann Carr-Boyd John Martin 3 mins, 36 sec. Rag for Razz (2010) violin and piano Ann Carr-Boyd Cedar-Rose Newman, John Martin 3 mins, 1 sec. Recorded/performed at: Tiger Recording Studios, Neutral Bay, NSW, on 17 Jun 05. Ann Carr-Boyd John Martin 3 mins, 14 sec. Recorded/performed at: Greenwich, NSW, on 15 Mar 92. Ann Carr-Boyd Edgars Kariks, Ann Carr-Boyd 13 mins, 33 sec. Recorded/performed at: 'Cool Valley' concert, Penrith, NSW, on 26 Jul 08. Ann Carr-Boyd David Papp, Manu Berkeljon, Victoria Jacono-Gilmovich, Yilin Zhu, Patrick Suthers 2 mins, 31 sec. Recorded/performed at: Tiger Recording Studios, Neutral Bay, NSW, on 17 Jun 05. Ann Carr-Boyd John Martin 5 mins, 1 sec. "One of the most rewarding things about writing music is the opportunity to meet and work with some of the most interesting people in the world. All the people and performers listed on these CDs (and many more who unfortunately can't all be fitted on to two CDs) have enriched my life with their musicality and their warmth of friendship. The years I spent with the Sydney Mandolins in the 1980s and onwards were just wonderful. I wrote at least 12 different works for them - and all were rehearsed to the most high point of performance and interpretation. Little did we know at the time that Fandango would become so well known - but we have all been happy to see Fandango launch out into the world with a whole adventurous life of its own. Score: Starburst : piano solo / Ann Carr-Boyd. 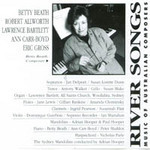 CD: River songs / Betty Beath ... [et al. ].